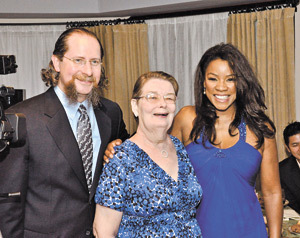 An evening of opera music featuring Metropolitan Opera star Denyce Graves was held recently to raise funds to benefit organ transplant surgery research and care at Johns Hopkins. The event, titled “Let the Music Move You,” was attended by 70 guests at the singer’s home in Bethesda, Md. Graves, the fiancee of Johns Hopkins chief transplant surgeon Robert Montgomery, sang pieces by Richard Strauss, Saint-Saens, Carrie Jacobs and Georges Bizet. Montgomery is best known for championing innovative approaches to increasing the supply of living donor organs, including altruistic donation and “domino donor” transplants involving as many as six unrelated transplant donors and recipients at one time. The event, which raised more than $70,000, was chaired by Margery and Thomas Pozefsky. Thomas Pozefsky is an assistant professor of medicine at Johns Hopkins and a physician in the Park Medical Associates group at Johns Hopkins at Green Spring Station.